Owning a backyard pool is an Aussie dream, albeit an expensive one. Installation and purchase costs aside, a typical in-ground pool can account for 17% of a home’s electricity usage, potentially adding $800 to $1,200 annually to a household’s power bill. So, how can you reduce your pool’s electricity usage, and can solar power help save on running costs? This article discusses ways to save on swimming pool running costs with solar. The pool pump is vital to keeping your pool clean and safe. It’s also by far the largest power-guzzling component of your swimming pool, so minimising its running costs is a priority. A typical pool pump has 1 horsepower (HP) and 240 volts, consuming roughly 32 kilowatt-hours (kWh). This approximately costs $1.10 per hour to run, depending on your electricity usage rates. In winter, when your pool is hardly used and the pool pump is run less often, this will add about $60 per month to your power bill. These costs can easily double in summer to around $120 per month when the pool is likely to see more use and the pool pump has to run more often. Solar pool pumps are designed to operate efficiently, using only the power of the sun. This means that it costs virtually nothing to run your pool pump aside from the initial purchase price, and installation costs. Dedicated solar pool pumps – also referred to as Direct Current (DC) pool pumps – are wired to 4-6 solar panels and are often suitable for pools up to 90,000 litres. Solar pool pumps operate whenever there is enough sunshine – which synchronises well as they have a higher output in summer, when your pool is most utilised. The panels can typically be installed nearby the pool and purchasers of solar pool pumps may be eligible for certain solar rebates. The biggest downside is that you will need to buy a new pool pump – it won’t work if you try to simply hook up your current pool pump to solar panels. 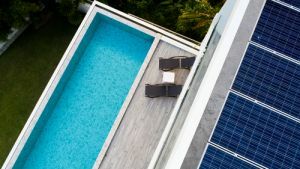 The other point to raise is that the solar pool pump and panels cannot be grid-connected – meaning you won’t receive a feed-in tariff for excess solar power that is generated but not needed, nor can you get extra power from the grid if there’s not enough sunlight to power your pool pump at any one time. For these reasons, an alternative option is to install a relatively large solar system for the entire house, and use some of that power for your pool pump. This can be more expensive, but could reap greater returns in the future. Solar pool pumps are relatively affordable, costing between $250 and $750 typically. Installing the solar panel component is however more expensive, and can set you back $1,500 to $4,000, depending on the number of panels, the difficulty of the installation, and your location. Solar pool pumps should recover their cost in the long-term through savings in electricity. Typically, it will take 3 to 7 years for a solar pool pump to recover its costs – including the solar panels. Keep in mind, however that while solar panels are typically warranted to last 10 years, the solar pool pump component usually only has a warranty for 2 or 3 years. This means you should factor in the cost of a replacement pool pump when considering how long it will take to recoup your initial costs. Pool heating is considered to be somewhat of a luxury feature, as it can cost up to a whopping $17 per hour to run according to the SA Government. Fortunately, there’s a number of solar solutions available that make pool heating affordable, allowing you to enjoy your pool year-round. Solar water heating takes a variety of forms. Firstly, some systems will combine your solar pool pump with a heating system. Using a solar heat exchanger component, the heat generated from your solar pool pump is used to warm up your pool, ensuring no energy is wasted. These hybrid systems usually require a grid connection however and may cost in the vicinity of $0.18 and $0.26 to run. There are also tubular pool heaters that operate similarly to solar hot water systems. Cool water is pumped behind solar panel cells, collecting heat before being redistributed back to the pool as warm water. This can be quite an expensive solution however, costing in excess of $1,000. The cheapest – albeit a slightly less effective – method of solar pool heating, is to purchase solar mats or pool covers, specifically designed to absorb and redistribute heat. You can pick up one of these for around $100 to $300. How else can I save on pool running costs? As this article demonstrates, there’s a variety of solar solutions on the market to help pool owners reduce their energy bill. If you can’t quite afford a solar pool pump, then consider upgrading to a more efficient model. The more energy efficiency stars that a pool pump has, the cheaper it is to run. While an efficient model could cost slightly more upfront, you should earn some long-term savings. With all that said, perhaps the most important, yet often overlooked, consideration when it comes to pool running costs, is the rate you pay for electricity. 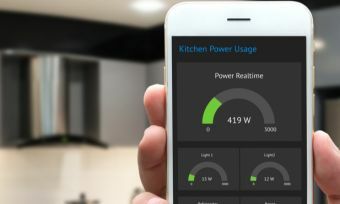 If you haven’t compared electricity providers for some time, then chances are you’re paying too much for power, and therefore too much on your pool. There is even an energy company dedicated to helping pool owners. To see what some of your options are, and whether you can save, check out Canstar Blue’s customer satisfaction ratings and price comparison tables.